Rachel Von | The Journal Gazette Carroll's Ethan Hicks, right, defeats Huntington North's Cody McCune 2-1 to win the 152-pound title Saturday at the Carroll Regional. 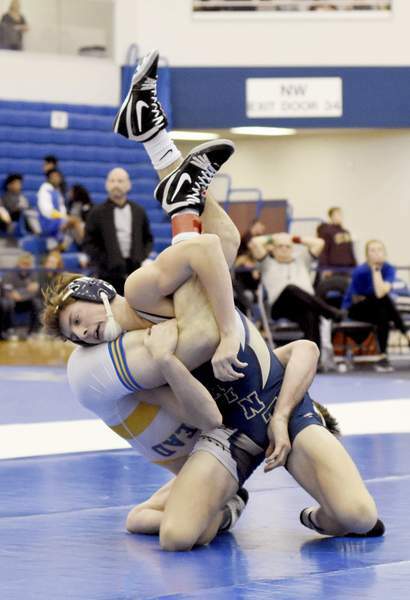 Wrestling for the 132-pound title at the Carroll Regional would've been motivation enough, but Owen Krider knew there was a little extra on the line in his championship match Saturday afternoon. His Chargers, who had claimed the previous six regional titles, were trailing Huntington North by 7.5 points, and Krider was set to face the Vikings' Ricky Haught. Krider pinned Haught at 3:46, nearly wiping out the gap between the teams. The Chargers took the lead in the next weight division, as Reis Schrock pinned Leo's Clayton Jackson. In the end, Carroll claimed its seventh consecutive regional title with 143.5 points, while Huntington North settled for second with 123. Garrett was third with 108.5 and Leo was fourth at 104. “We knew we were coming into the strength of our lineup there at 132, and we matched up with Huntington North in that matchup, so for him to get the pin there, that was great for us, for momentum and the team score,” Carroll coach Tim Sloffer said. In addition to Krider's match against Haught, Carroll's Scottie Saylor was pitted against Huntington North's Mathew Kline in the 145 third-place match, and Carroll's Ethan Hicks faced Huntington North's Cody McCune in the 152-pound championship. Saylor pinned Kline, while Hicks won a 2-1 decision. Probably the closest match of the day came in the 285 final, after the team standings had already been determined. 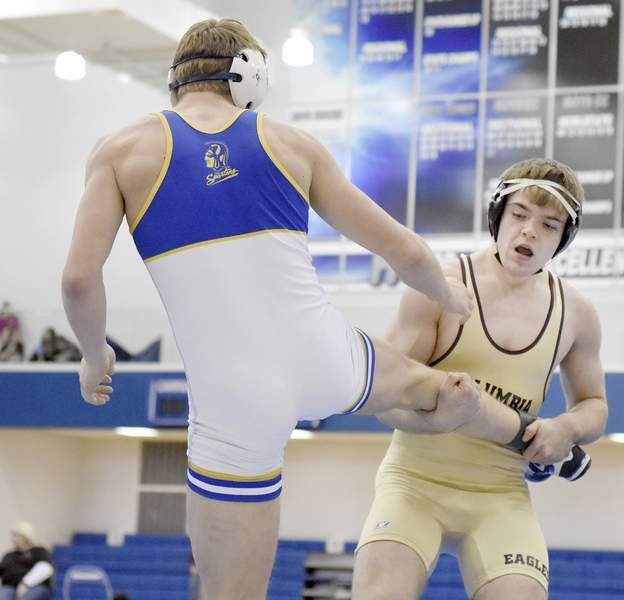 Carroll's Reeve Muncie and Eastside's Chase Leeper had split their two earlier matches this season, and the third was the closest yet, going into overtime tied 1-1. “I just knew I had to keep control of my ties and everything, make sure he couldn't get out of the headlock, because that's what he did last time,” said Muncie, who eventually won 2-1. The Vikings built a lead early in the championship round as Brady Lewis pinned Garrett's Colton Weimer in the 106 final, and Preston Teusch won the 112 final with a major decision (13-3) over Leo's Jacob Veatch. Beau Humphrey claimed Snider's lone victory at 120, pinning Garrett's Chandler Shearer at 5:32. 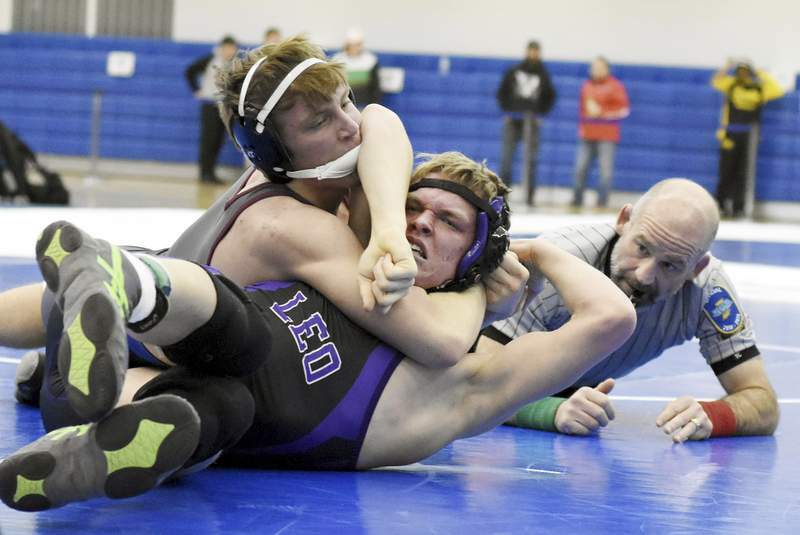 Leo's Ian Heath won the 126 bracket by pinning Carroll's Evan Ulrick. 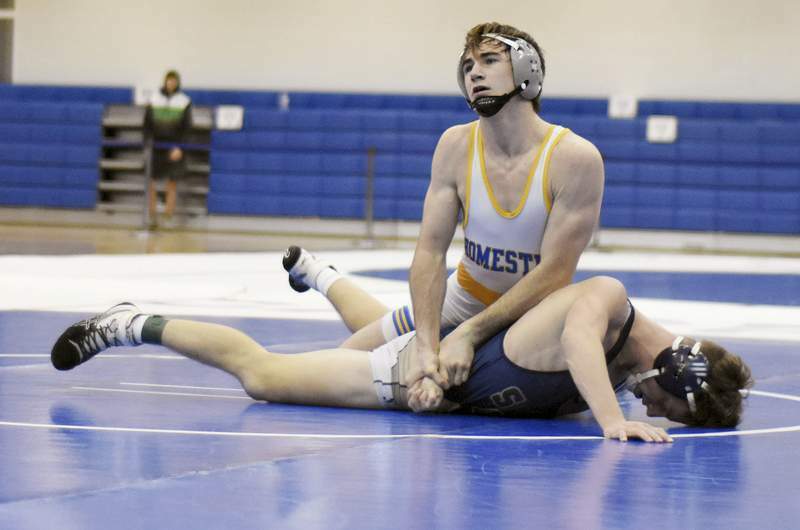 At 145, Homestead's Jake Jenkins won by major decision, 13-2, over Michael Garrett of Bishop Dwenger. 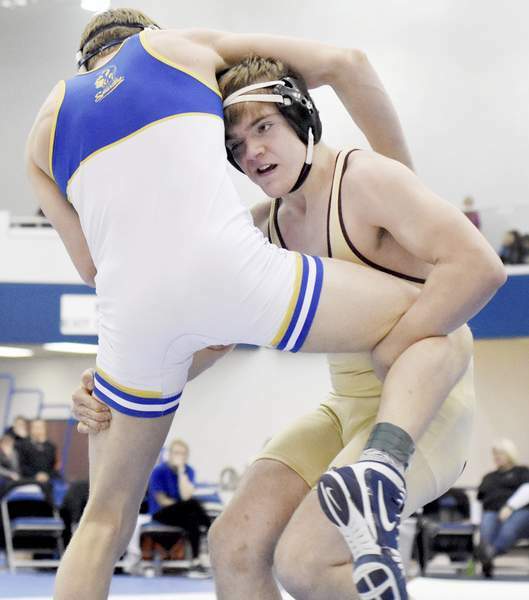 Columbia City's Jackson Pettigrew beat Homestead's Joe Parrish by a 9-5 decision in the 160 final, and Garrett's Clayton Fielden won the 170 championship match with a technical fall (18-1) over Leo's Jacob Fletcher. Garrett also claimed the 182 championship as Austin Leech beat Wayne's Justin McDonald by a 3-1 decision. Huntington North got its final win at 195 as Charlie Agnew beat New Haven's Tristen Martz by a 5-0 decision, and Leo's Jayden Elwood pinned Churubusco's Reese Wicker in the 220 final. The top four finishers in all weight classes advance to the semistate tournament at Memorial Coliseum next Saturday. Adams Central won the Jay County Regional with 140 points, followed by Norwell (97.5) and Bellmont (88). Logan Mosser (132), Logan Macklin (145), Parker Bates (170) and Jashawn Berlanga (220) all won their weight divisions for the Flying Jets. Norwell's Kade Zadylak won at 120, while Isaac Ruble (106) and Jon Ruble (160) won for Bellmont. Wawasee finished second behind Penn at the Penn Regional. Warsaw was sixth. The Warriors claimed wins at 132 and 138, as Geremiah Brooks beat Penn's Nate Hadary by major decision, 12-4, and Braxton Alexander pinned Mishawaka's Gabriel Weeks. Qualifiers from Penn will compete in the East Chicago semistate next week.